The New York Mets defeated the Philadelphia Phillies 3-0 on Wednesday on a three-run, walk-off home run by Brandon Nimmo in the bottom of the 10th inning. After the two teams went more than nine innings without scoring a run, Nimmo stepped up and jacked one over the fence. It was only New York's fourth hit of the game. The last three Mets' home wins have come by walk-off home runs (Jose Bautista June 26, Wilmer Flores July 6 and Nimmo on Wednesday). 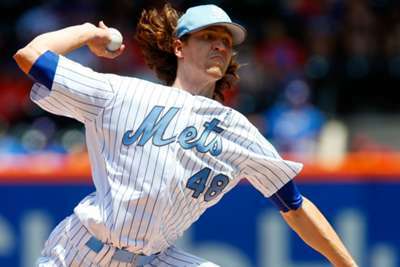 Jacob deGrom started for the Mets, tossing eight scoreless innings with seven strikeouts. But once again he received little, and in this case, zero run support. DeGrom currently sits 5-4 with a 1.68 ERA this season, making him a National League Cy Young candidate. But he has won just one of his last 10 starts, despite allowing just 13 runs in 72 innings during that time. Teams hoping to contend for a World Series this season and beyond would surely love to add deGrom to their rosters, and it may be time for the Mets to cash in. Chis Sale struck out 12 batters in seven shut-out innings to lead the Red Sox to their ninth straight win with a 4-2 victory over the Rangers. Sale is now 10-4 with a 2.23 ERA. Yankees starter Sonny Gray tossed six shut-out innings with eight strikeouts in a 9-0 win over the Orioles. Gray has been awful this season (5.46 ERA), but he could hit his stride during the second half of the season like he did last year. Rays first baseman C.J. Cron collected three hits including his 18th home run and three RBIs in a 4-2 win over the Tigers. Cron, now slashing .253/.326/.475 is enjoying a career year as an everyday player. Reds starting pitcher Tyler Mahle allowed seven runs (five earned) in just 2.1 innings in a 19-4 loss to the Indians. Seven Cleveland hitters had multi-hit games and seven had multiple RBIs. Mahle led the charge in Cincinnati's struggle from the mound. Buster Posey's third hit of the game was a walk off in a 5-4, 13-inning win against the Cubs. Two teams trying to earn postseason bids in a tight National League face off on Thursday. Arizona will send struggling Robbie Ray (3-1, 5.23 ERA) to the mound to face off against Kyle Freeland of Colorado (8-6, 3.18 ERA). The Diamondbacks have recently righted the ship after losing six of seven games.